Oh Canada! Where does Canada stand on the ELD mandate? When does the eld mandate take effect? As of today, the Canadian Government has not finalized the Canadian ELD Mandate. However, fleets should prepare today because we expect the final ELD deadline to be within the next 2 years. 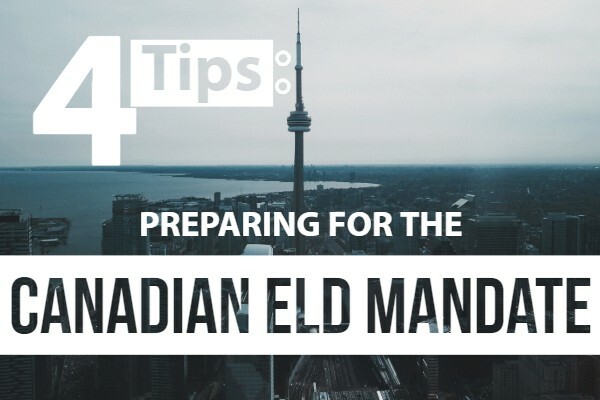 In this guide, we’ll share 4 tips to prepare for the Canadian ELD mandate, based on our experience with the American ELD mandate. What can Canadian fleets do differently for the Canadian ELD Mandate? We recommend fleets to educate drivers on how to drive efficiently within their hours of service. 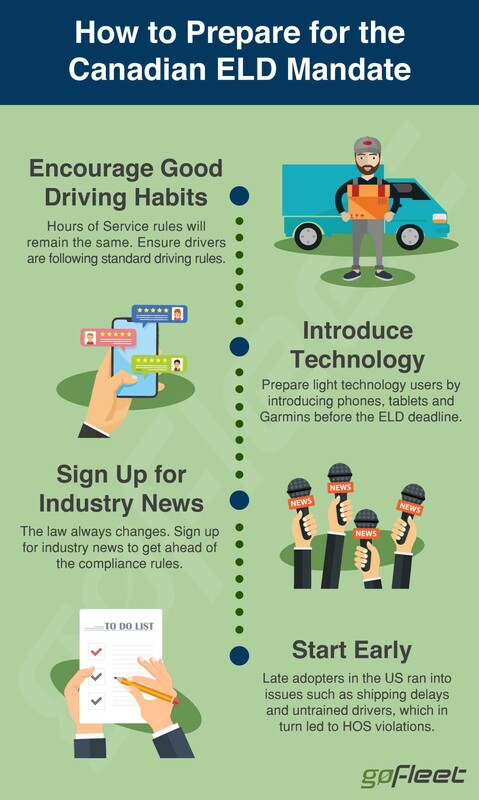 In turn, drivers do not have to rely on skimming hours and will not experience major changes with ELDs. In turn, our next recommendation is to introduce technology in phases. For instance, in order to prepare for ELDs, a trucking fleet started installing tablets in every truck to display route maps. The company found that veteran drivers quickly learned how to use their new tablets. Afterward, when the fleet installed ELD devices, the same drivers were able to easily use their new ELD app because they had experience using tablets. Our first two recommendations – driving habits and technology – focused on the driver. However, fleet managers also need to adapt to changes in a Canadian ELD Mandate. Our biggest recommendation is to sign up for industry news. In the US, we found that over 50% of fleet managers did not know enough about the ELD mandate. The other fleet managers, however, were better prepared because they attended industry webinars and read white papers. Thankfully, GoFleet has you covered! Over the next few months, we are hosting live webinars where you can learn about the Canadian ELD Mandate and get answers on your ELD questions. Seriously, start early! This is something that a lot of fleets did not do for the US ELD mandate, and that led to some serious issues. Shipping delays due to low stock, resulting in missing the ELD mandate. Drivers do not get time to learn how to use the ELDs. In turn, some impatient officers decided to fine drivers with ELDs if they didn’t know how to show their ELD logs. Sign up for our newsletters at the bottom of our web pages to get invitations to Canadian ELD Mandate Webinars!